iMessage, a strikingly convenient instant messaging service, makes it completely possible for any Apple users to send not only texts and documents, but also videos, audios, photos, location, emoji and more attachments over Wi-Fi or cellular data. Definitely, the richer the content transferred, the more important the data is. In this way, it is particularly essential to back up your iMessages to prevent sudden data loss. As usual, you might immediately think of iCloud backup, which however only shows limited free 5GB to store iOS data. How about learning here to know how to backup iMessage without iCloud easily and comprehensively using 2 available solutions? Take a look now. As a matter of fact, iTunes is a great tool that you can apply to back up iMessages on iPhone/iPad/iPod touch free of charge. It combines "Back Up" and "Restore" options together to better facilitate you. Let's see how it performs. Step 4: Encrypt backup as you wish and click on "Back Up Now" to initiate backup process. 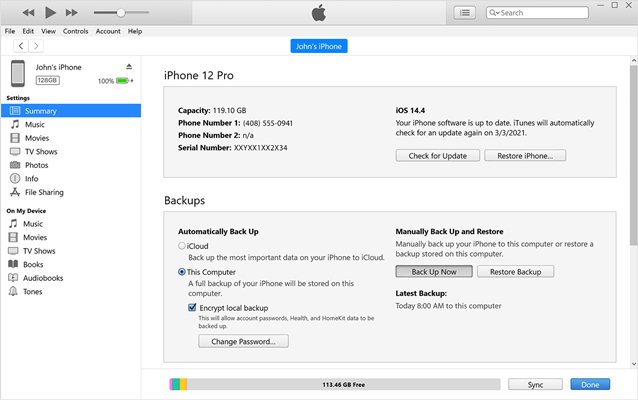 Note: iTunes will back up the entire iOS data files, iMessages included, to its new backup. Besides, there is no access for you to view what exactly contain in iTunes backup content. With the exception of iTunes backup, you can also take advantage of another professional tool to help you. 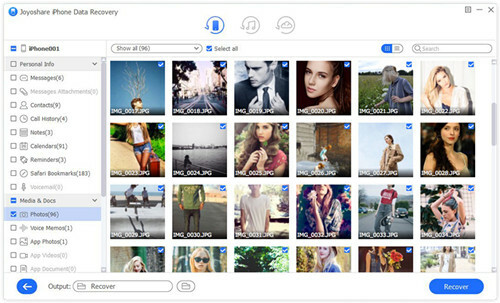 Here Joyoshare iPhone Data Recovery is a well-liked and all-round software that backs up iMessages safely and independently in a special way. With the aid of it, it's unnecessary to create a backup for the whole iOS data. You have right to only retrieve and back up iMessages, which saves much storage space at the same time. What's better, this excellent iMessage backup program also makes it workable to preview iMessages before recovery. In addition, your iMessages backup file can be viewed whenever you want. Any of your previous backups will not be replaced and affected. Sure, it's available to use this program to restore and back up other iOS files to computer, such as photos, videos, notes, reminders, Safari bookmarks, contacts, calendars, call history, etc. 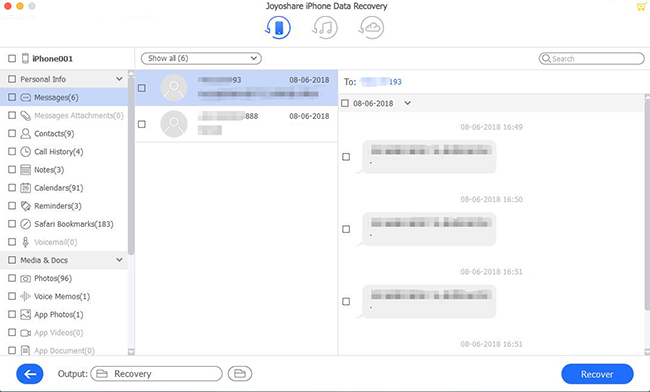 To solve your puzzle on how does Joyoshare iPhone Data Recovery back up iMessages without iCloud, here we are going to take its Mac version as an example to demonstrate specific steps. 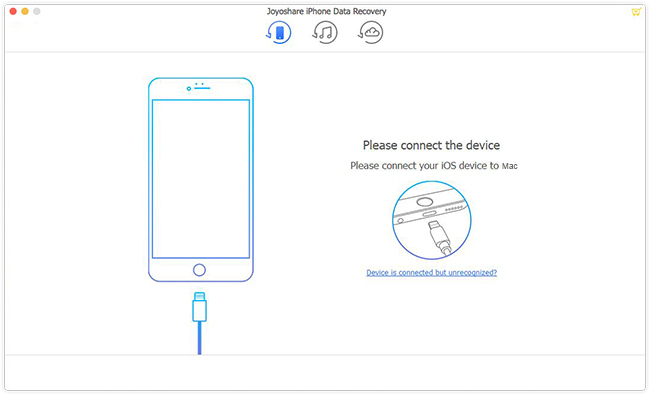 At first, download and install Joyoshare iPhone Data Recovery on your Mac. Then simply get it launched and connect your iOS device to the computer with a USB cable under "Recover from iDevice" mode. Remember to "Trust" computer on your iDevice. Note: At this step, you can go to "Menu" at the upper right corner and choose "Preferences" to confirm your own requirement, which enables you to decide storage location, recovered file format and so on. 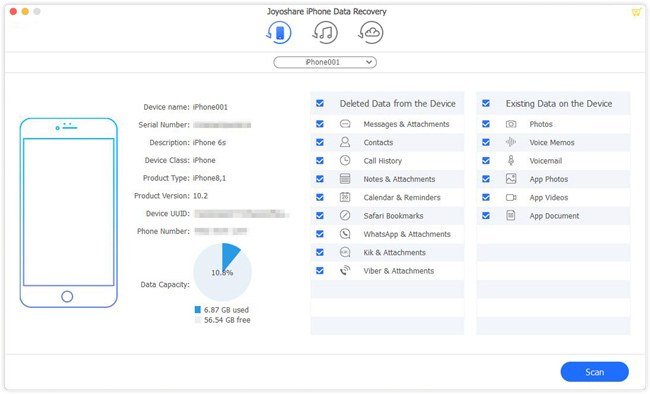 Having successfully detected and recognized your iOS device, Joyoshare iPhone Data Recovery will bring both device info and supported data types for your reference. You can either scan all checked data files by default or only select "Messages & Attachments" to scan with the simple "Scan" button at the right bottom. Soon after, Joyoshare will display all recoverable messages and iMessages for you to choose. You are allowed to preview these results one by one and get what you need selected after careful check. To press on the "Recover" button, all chosen iMessages will be saved and backed up to your computer's local folder.